Tragedy on Little Brewster Island memorialized. The first keeper of Boston Light, Boston’s historic lighthouse on Little Brewster Island in Boston Harbor, was hired in 1716. Two short years later, he and his family drowned in 1718 on their way back to Little Brewster Island from attending church on the mainland. Several days later, the man’s replacement drowned as well. The strange double-tragedy inspired young Benjamin Franklin to write and distribute his ballad, The Light House Tragedy. 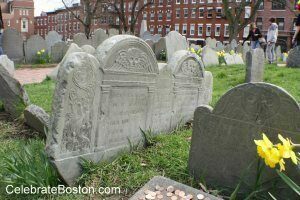 This triple headstone can be found near the center of the cemetery, and serves as a memorial to this strange and tragic week in Boston Light’s history.